To discover prostate cancer biomarkers, we profiled gene expression in benign and malignant cells laser capture microdissected (LCM) from prostate tissues and metastatic prostatic adenocarcinomas. Here we present methods developed, optimized, and validated to obtain high quality gene expression data. RNase inhibitor was included in solutions used to stain frozen tissue sections for LCM, which improved RNA quality significantly. Quantitative PCR assays, requiring minimal amounts of LCM RNA, were developed to determine RNA quality and concentration. SuperScript II™ reverse transcriptase was replaced with SuperScript III™, and SpeedVac concentration was eliminated to optimize linear amplification. The GeneChip® IVT labeling kit was used rather than the Enzo BioArray™ HighYield™ RNA transcript labeling kit since side-by-side comparisons indicated high-end signal saturation with the latter. We obtained 72 μg of labeled complementary RNA on average after linear amplification of about 2 ng of total RNA. Unsupervised clustering placed 5/5 normal and 2/2 benign prostatic hyperplasia cases in one group, 5/7 Gleason pattern 3 cases in another group, and the remaining 2/7 pattern 3 cases in a third group with 8/8 Gleason pattern 5 cases and 3/3 metastatic prostatic adenocarcinomas. Differential expression of alpha-methylacyl coenzyme A racemase (AMACR) and hepsin was confirmed using quantitative PCR. Gene expression was profiled in prostate cells to discover candidate biomarkers for early detection of prostate cancer and assessment of cancer aggressiveness. Specific populations of benign and malignant cells were collected from frozen prostate tissues using laser capture microdissection (LCM). RNA was isolated from the cells and amplified to obtain sufficient quantities of labeled antisense RNA for microarray expression profiling. Numerous publications have described amplification methods [1–15] and linear amplification  has been used extensively. Optimization and standardization of methods will likely improve overall correlations between microarray studies , especially for experiments involving LCM. Methods upstream of RNA amplification, including frozen tissue processing, are crucial for preserving RNA integrity and obtaining accurate results from microarray experiments. A complete protocol for LCM, linear amplification of RNA, and microarray expression profiling is presented here. The protocol includes a quantitative PCR (qPCR) method for determining RNA concentration and integrity that is amenable to limited quantities of RNA obtained from LCM samples. Confirmation of microarray results using qPCR is also presented. The quality of total RNA extracted from stained tissues was assessed using an Agilent bioanalyzer . Significant RNA degradation occurred during the staining protocol, probably due to reactivation of endogenous nucleases in aqueous solutions. RNase inhibitor was, therefore, included in all staining solutions except xylene, in which it is insoluble. Electropherograms of total RNA extracted from serial sections of three representative prostate tissue specimens that were unstained, stained in the absence of RNase inhibitor, or stained in the presence of RNase inhibitor are presented in Fig. 1. Relative to unstained tissues, RNA degradation occurred in tissues stained in the absence of RNase inhibitor, as evidenced by a shortening and broadening of the 28S ribosomal RNA peak at about 48 seconds. In all cases, degradation was decreased when tissues were stained in the presence of RNase inhibitor, as evidenced by recovery of the 28S ribosomal RNA peak height. Preservation of RNA integrity by inclusion of RNase inhibitor in solutions for staining frozen tissue sections. (A-C), electropherograms of total RNA samples from serial sections of frozen tissues that were unstained (UN), stained in the absence of RNase inhibitor (WOUT), or stained in the presence of RNase inhibitor (W). Quantitative measures of RNA degradation, Degradation Factors and RNA Integrity Numbers [18, 19], based on the electropherograms presented in Fig. 1 are provided [see Additional file 1]. These quantitative measures were in accordance with visual interpretations. We also developed a qPCR assay to characterize RNA integrity using primer pairs specific for the 5' and 3' ends of the PSA transcript. The qPCR results [see Additional file 2] correlated well with quality assessments based on electrophoretic traces. Interestingly, tissues that appeared similar in terms of RNA integrity when unstained were observed to differ significantly in RNA degradation after staining, especially in the absence of RNase inhibitor. Specific cell populations based on primary Gleason pattern [20, 21] were collected using LCM. Epithelial cells were captured from five benign tissues and two cases with benign prostatic hyperplasia (BPH). Primary Gleason pattern 3, 4, and 5 cells were collected from seven, two, and eight cases, respectively. Tumor cells were also collected from three cases of prostate cancer lymph node metastases. LCM images taken before, during, and after capture of primary Gleason pattern 3 cells are presented [see Additional file 3]. We attempted to use a NanoDrop® spectrophotometer to quantify the limited amounts of LCM RNA because the small sample requirement (1–2 μL) precludes the need for sample dilution. Measurements typically were not reproducible, presumably because the sample concentrations were at or below the detection limit of 1.5 ng/μL . Determination of RNA quality using the Agilent bioanalyzer also lacked reproducibility, even though the total RNA Pico assay has a qualitative range of 200–5000 pg/μL . We, therefore, developed a qPCR assay to assess RNA quantity and integrity. A primer set specific for the 3' end of the β-actin transcript was designed to quantify relative RNA concentrations. 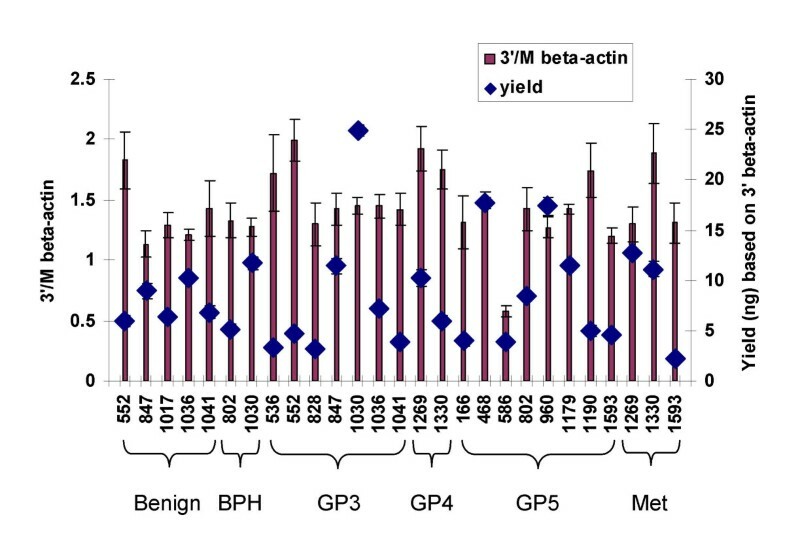 β-actin was used for normalization rather than GAPDH because GAPDH expression levels have been shown to correlate with pathologic stage in human prostate tumors . The 3' β-actin primer set was combined with another primer set specific for the middle (M) region of the β-actin transcript to determine 3'/M β-actin ratios for assessment of RNA quality. The primer sets are designated 3' and M because the amplicons they generate fall within the target sequences used to design the 3' and M beta-actin probes on the Affymetrix U133 Plus 2.0 array. The ratio of the RNA quantities determined using the two primer sets is indicative of RNA quality. This is because oligo(dT) primer is used to synthesize cDNA template for amplification in qPCR, allowing only transcripts with intact 3' ends to be detected. Transcripts shortened due to degradation are detected as having less amplification of their upstream ends and, therefore, higher 3'/M ratios. Results of the analysis of RNA quality and concentration based on qPCR with β-actin primers are presented in Fig. 2 for samples obtained after LCM of 27 prostate tissues. Since the 3'/M β-actin ratios were all two or lower, this was established as a quality control parameter for proceeding with linear amplification. One case, 586-GP5, was observed to be an outlier with a 3'/M beta-actin ratio of 0.6, and this result was reproduced. Yields of RNA obtained for the different cases varied substantially. Yield was not observed to correlate with quality since even samples with low yield (e.g., 1593-GP5) had good quality RNA. We, therefore, sought to determine if there was a correlation between yield and number of cells collected for the different cases. We used the number of laser pulses performed during capture of cells as an approximation of the number of cells collected for each case. There was no discernable correlation between yield and number of laser pulses or tissue type [see Additional file 4]. Individual cases appear to differ significantly in RNA content, making it difficult to determine how many cells must be collected to obtain sufficient RNA for linear amplification. Yield and integrity of RNA isolated from laser capture microdissected cells. (Left axis), 3'/M beta-actin ratios determined by qPCR as a measure of the quality of RNA samples obtained by LCM of a total of 27 cases of benign prostate, benign prostatic hyperplasia (BPH), primary Gleason pattern 3 (GP3), pattern 4 (GP4), pattern 5 (GP5), and metastatic prostate cancer (Met). (Right axis), relative yields of LCM RNA samples based on qPCR with primers specific for the 3' end of the beta-actin transcript. To determine whether to use the IVT kit [25, 26] or the Enzo kit in our linear amplification protocol, we performed a side-by-side comparison. Samples of total RNA from Gleason pattern 3 and Gleason pattern 5 microdissected cells were amplified and labeled using each kit. Different amounts of total RNA from Gleason pattern 3 and Gleason pattern 5 cells, 0.7 ng and 5.3 ng, respectively, were amplified to determine if 2- to 10-fold less than the minimum recommended amount of input RNA could yield sufficient labeled cRNA for hybridization to a microarray. This was important since it was not feasible to obtain 10–100 ng of RNA from microdissected cells for most of the 27 prostate tissues analyzed (Fig. 2). Furthermore, to avoid concentrating the RNA [see Additional file 5], the total amount of RNA needed for linear amplification should be contained in 4 μL or less (see Materials and Methods). This volume is limited by the minimum volume of buffer, 11 μL, needed to elute RNA from the purification column. A sufficient yield of labeled cRNA (21–72 μg) was obtained for each sample to hybridize 15 μg to a U133 Plus 2.0 array. Correlation plots were generated using un-normalized expression data from GCOS 1.1. Signal correlations (R2) were 0.94 for inter-assay comparisons (Figures 3A and 3B). Saturation of signal intensities for transcripts expressed at higher levels was apparent for targets prepared using the Enzo kit since the plots assumed a banana shape at higher signals. In agreement with these results, previous studies indicated that use of the Enzo kit to prepare targets for hybridization to the U133 Plus 2.0 array resulted in some degree of saturation of signal intensities for transcripts expressed at very high levels compared with data obtained on the U133A array, and the IVT kit alleviates the high-end saturation effect observed with the Enzo kit . We chose to use the IVT kit in our linear amplification protocol. Signal correlation scatter plots for inter-assay and intra-assay comparisons of the IVT and Enzo transcript labeling kits. Samples of total RNA from Gleason pattern 3 (GP3) and pattern 5 (GP5) laser capture microdissected cells were linearly amplified, labeled using the IVT kit or the Enzo kit, and hybridized to HG-U133 Plus 2.0 arrays. 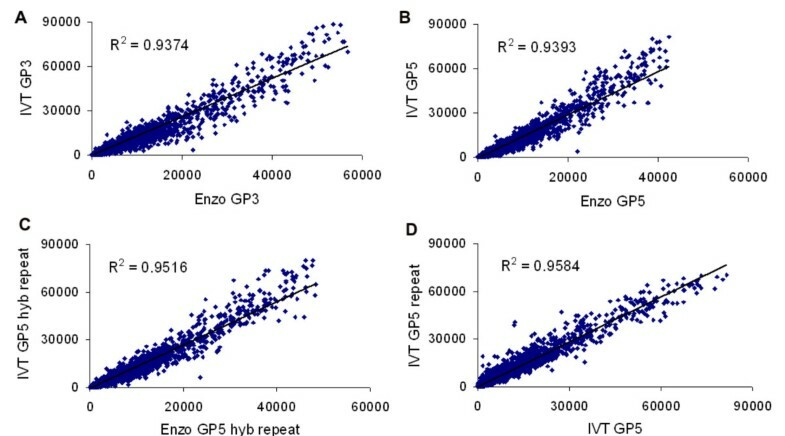 Signal correlation of inter-assay analysis comparing GP3 samples (A), GP5 samples (B), and hybridization replicates (see Results) of GP5 samples (C) labeled using the IVT or Enzo kit. (D), signal correlation of intra-assay analysis comparing replicate GP5 samples amplified on different days starting with 2 ng or 5 ng of total RNA, labeled using the IVT kit, and scanned using two different GeneChip® Scanner 3000 instruments. Note that the intensity level ranges for transcripts labeled with the IVT and Enzo kits are different. We investigated the reproducibility of the final steps of the procedure, namely fragmentation of additional aliquots of the Gleason pattern 5 cRNA samples labeled using the IVT kit or the Enzo kit, hybridization of the fragmented cRNA to U133 Plus 2.0 arrays from a different lot, washing, staining, and scanning (referred to as hybridization replicates). Enzo saturation was again evident in the correlation plot of the hybridization replicates, and the inter-assay signal correlation (R2) was 0.95 (Fig. 3C). For comparison, Fig. 3D shows a scatter plot correlation of expression data from replicate Gleason pattern 5 samples amplified and labeled on different days using the IVT kit. The replicates were treated the same except that different amounts of total RNA (approximately 2 ng and 5 ng) were used for amplification, and the microarrays were scanned using two different GeneChip® Scanner 3000 instruments. The intra-assay correlation (R2 = 0.96) was better than the inter-assay correlations (R2 = 0.94–0.95), and no banana shape was evident. The hybridization replicates allowed another interesting analysis to be performed. Signal correlation (R2) between replicate hybridizations was plotted against signal intensity for Gleason pattern 5 samples labeled using the IVT kit or the Enzo kit. Correlations between hybridization replicates decreased rapidly with decreasing signal intensity both for samples labeled using the IVT kit and the Enzo kit [see Additional file 6]. Average signal intensities obtained with the IVT kit were significantly lower than those obtained with the Enzo kit, shifting the entire plot to the left. Signal correlations between hybridization replicates represented a best-case scenario; therefore, replicates of the entire linear amplification procedure were also analyzed. For any given intensity value, the correlation was significantly higher between the hybridization replicates than the replicates of the entire linear amplification protocol. Equivalent amounts (about 2 ng) of total RNA from normal epithelial cells, BPH cells, Gleason pattern 3 cells, Gleason pattern 5 cells, and lymph node metastases that were microdissected from 25 total cases were amplified and labeled using the IVT kit as described in Methods. SuperScript™ III, rather than SuperScript™ II, was used to synthesize cDNA since it was found to be more processive [see Additional file 7]. The average yield of labeled cRNA was 72 μg (ranging from 42–94 μg). The average size of the biotinylated cRNA was about 750 base pairs for each of the 25 cases. The average fold amplification during the first round was 60-fold, which was significantly greater than the 4–10-fold recommended by the Working Group . The average fold amplification during the second round was about 800-fold, whereas it should have been about 400-fold according to the Working Group . A so-called "normalizer sample" was amplified along with the other 25 samples. This sample consisted of RNA from microdissected Gleason pattern 4 cells. Aliquots of the normalizer sample were stored at -80°C to allow one aliquot to be amplified with each subsequent batch of test samples to serve as a replicate and an indicator of batch-to-batch variability. Probesets detected as present were binned into low, medium, and high expression level categories [see Additional file 8] [see Additional file 9]. The coefficient of variance for the number of probesets in each bin was generally low (less than 6%). We observed no apparent correlation between the yield or RNA integrity based on the 3'/M β-actin assay and the number of probesets in different bins. Unsupervised clustering using less than 2000 genes grouped 5/5 normal and 2/2 BPH cases in one clade, 5/7 Gleason pattern 3 cases in another clade, and the remaining 2/7 pattern 3 cases in a third clade that also included 8/8 Gleason pattern 5 cases along with 3/3 lymph node metastases (Fig. 4). The normalizer sample (Gleason pattern 4) clustered with the high-grade samples. Unsupervised clustering based on gene expression profiling of benign prostatic epithelial, primary prostate cancer, and metastatic prostate cancer cells laser capture microdissected from 26 cases. Results of unsupervised clustering using the dChip PM-only model (A and B) or the PM/MM difference model (C and D) to calculate expression values, which were (B and D) or were not (A and C) log transformed. Approximately 1500–2000 genes with the highest standard deviation/mean (not log transformed) or the highest standard deviation (log transformed) were used in the analysis. Green: benign; teal: benign prostatic hyperplasia; blue: Gleason pattern 3; orange: Gleason pattern 5; pink: metastatic prostate cancer; normalizer: normalizer sample (Gleason pattern 4, see Results). Principal components analysis [see Additional file 10] showed segregation of samples along Eigengene vector 1 to be predominately by Gleason pattern. From left to right, a progression was observed from benign prostatic epithelial and BPH cells to Gleason pattern 3, Gleason pattern 5, and metastatic cells. We used qPCR to confirm differential expression of alpha-methylacyl coenzyme A racemase (AMACR) and hepsin detected using microarrays. Aliquots of the same samples that were amplified and labeled to generate microarray results were also analyzed by qPCR before and after linear amplification. Relative expression levels of AMACR and hepsin measured by qPCR in unamplified samples correlated well with results obtained with amplified samples and with microarray results (Fig. 5). Both AMACR and hepsin were upregulated in prostate cancer compared to benign prostatic epithelial cells. The mean fold difference for AMACR expression between prostate cancer and benign cells was 5.3 (p = 0.02) in unamplified samples, 4.5 (p = 0.014) after linear amplification, and 4.2 (p = 0.004) as determined by microarray analysis. 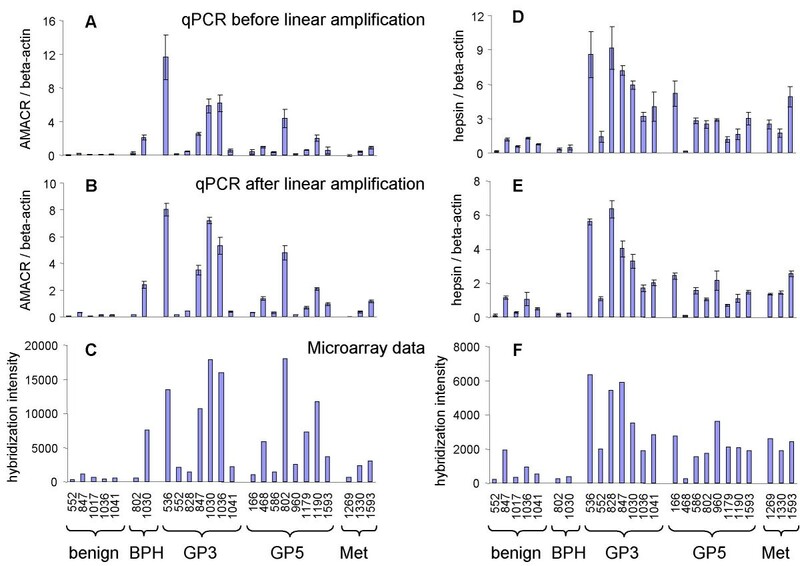 The mean fold difference for hepsin expression between prostate cancer and benign cells was 5.7 (p = 0.00004) for unamplified samples, 4.4 (p = 0.0003) after linear amplification, and 4.3 (p = 0.00003) as determined by microarray analysis. The fidelity of differential gene expression was, therefore, preserved during the linear amplification procedure. Correlations between microarray and qPCR data after linear amplification were 0.83 and 0.87 for AMACR and hepsin expression, respectively. Expression of hepsin was highest on average in Gleason pattern 3 cells (5.6 ± 2.9 hepsin/beta-actin ratio), and was observed to decrease in high grade, Gleason pattern 5 and lymph node metastasis, samples (2.6 ± 1.5) to a level intermediate between benign (0.7 ± 0.4) and low grade, Gleason pattern 3, cells (Figures 5D–5F). Interestingly, a similar pattern was observed for AMACR expression (Figures 5A–5C). Confirmation of microarray data using qPCR. Relative expression levels of AMACR (A-C) and hepsin (D-F) in benign prostatic epithelial, primary prostate cancer, and metastatic prostate cancer cells laser capture microdissected from 25 cases were measured using qPCR (A, B, D, E) and HG-U133 Plus 2.0 arrays (C and F). Quantitative PCR was performed using cDNA synthesized from RNA samples before (A and D) and after (B and E) linear amplification. For microarray analysis, RNA samples were linearly amplified and labeled using the IVT kit. Specific cell populations were captured based on primary Gleason pattern, and their gene expression profiles were analyzed. In general, unsupervised clustering grouped cases in accordance with Gleason pattern. However, the grouping was not perfect in this regard since two of seven Gleason pattern 3 cases clustered with Gleason pattern 5 cases and lymph node metastases. The molecular profile may provide more detailed information than the Gleason pattern, indicating that the Gleason 3 cases are more aggressive, or have the potential to be more aggressive, than expected based on histology alone. In agreement with previous results [28–35] we found that the type II transmembrane serine protease hepsin is approximately 5-fold overexpressed in prostate cancer cells compared to benign prostatic epithelial cells. Furthermore, metastatic cells and Gleason pattern 5 cells, which grouped together in unsupervised clustering, had hepsin expression levels intermediate between Gleason pattern 3 and benign cells. Hepsin immunohistochemistry has indicated that the staining intensity of hormone-refractory metastatic cancers is intermediate between localized prostate tumors (Gleason score 6–8) and benign prostate . The lymph node metastasis cases we analyzed were not hormone-refractory, indicating that hepsin expression may not be regulated by hormones. Also in agreement with previously results [29, 31, 35–37] we observed up-regulation of AMACR expression in prostate cancer relative to benign cells (about 5-fold). The expression pattern of AMACR was similar to that of hepsin in that AMACR expression in high grade, Gleason pattern 5 and metastatic cancer, cells was intermediate between low grade, Gleason pattern 3, and benign cells. Interestingly, AMACR expression has been reported to be lower in hormone-refractory metastatic prostate cancer than hormone-naïve-localized prostate cancer , suggesting that AMACR protein expression might be regulated by androgens. A subsequent report  suggests, however, that AMACR expression is not hormone-dependent, but that it may be a marker of tumor differentiation. This is consistent with the data presented here showing decreased AMACR expression in Gleason pattern 5 cells and non-hormone-refractory lymph node metastases relative to Gleason pattern 3 cells. Interestingly, in a recently published gene expression study of laser microbeam microdissected populations of prostate cancer, prostatic intraepithelial neoplasia (PIN), and normal prostatic epithelial cells  hepsin was not found to be differentially expressed between normal epithelium and PINs and prostate tumors, but AMACR was found to be up-regulated. Recommendations of the Working Group  for fold amplification during the first and second rounds of linear amplification may not be based on experiments where minimum amounts of input RNA were amplified (less than 200 ng). Therefore, the relevance of these recommendations to such experiments is unclear. The ability to successfully amplify small amounts of total RNA is becoming increasingly important. LCM is labor-intensive, especially given the need for significant numbers of biological replicates when analyzing human specimens. Minimizing the requirements for input RNA can have a significant impact on study feasibility. In addition, interest in analyzing individual cells continues to grow . Standards for the size of biotinylated cRNA obtained from two cycle amplification protocols are needed. For one cycle experiments, the Working Group recommends that the biotinylated cRNA should be 500–3,000 base pairs in size, and that samples that do not meet these criteria should be discarded . However, two cycle amplification protocols are biased to the 3' ends of transcripts. We developed qPCR assays to assess RNA quality and quantity. Our qPCR assay for RNA quality is analogous to the 3'/5' and 3'/M ratios for GAPDH and β-actin that are quality control parameters for Affymetrix microarrays . Arcturus has also provided a qPCR protocol to assess RNA quality in formalin fixed paraffin embedded tissues . Quantitative PCR assays are fairly reproducible [see Additional file 11] and extremely sensitive, requiring significantly less sample than the NanoDrop® ND-1000 spectrophotometer and the Agilent 2100 bioanalyzer for analysis of RNA quality and quantity. In addition, qPCR is a more direct, functional assay for mRNA quality than analysis of ribosomal RNA as a surrogate for mRNA using the Agilent bioanalyzer. It is also noteworthy that measurements of absorbance at 260 nm can be misleading because degraded RNA will also contribute to the absorbance, which could give an erroneously high estimate of intact RNA concentration. Using the U133 Plus 2.0 arrays, the reliability of the signal was observed to decrease dramatically with decreased intensity [see Additional file 6]. It may be possible to increase the sensitivity by hybridizing larger amounts of labeled targets to the arrays. As expected, correlations between hybridization replicates were significantly better than correlations between replicates of the entire protocol performed on different days. The correlation between biological replicates would be expected to be even less. We compared the IVT and ENZO kits using signal correlation plots. However, it is difficult to determine which kit is superior in the absence of a comprehensive set of known differences in gene expression. A better comparison could be achieved by performing spike-in experiments [25, 26] or comprehensive qPCR confirmation of differentially expressed genes. Surgical specimens with written patient consent were obtained from the Mayo Clinic Specialized Program of Research Excellence in Prostate Cancer (SPORE) tumor bank with Institutional Review Board approval (#1937-00). After radical prostatectomy, tissues from patients that had not received preoperative hormonal therapy, chemotherapy, or radiation therapy were flash frozen in liquid nitrogen and stored at -80°C. Fisherbrand Superfrost uncharged slides (Fisher Scientific, Hampton, NH) were baked at 220°C for at least two hours. Frozen tissue sections were cut at 5 μm in a -20°C cryostat and placed on slides pre-chilled at 4°C. After the tissue adhered to the slide, the slide was immediately placed on a flat piece of dry ice. The slides were placed in a chilled slide box on dry ice, transported under dry ice, and stored at -80°C. Sections from each tissue specimen were stained with hematoxylin and eosin and analyzed by a pathologist. Frozen tissue sections were stained using the HistoGene™ LCM Frozen Section Staining Kit (Arcturus, Mountain View, CA) according to the manufacturer's protocol , with the following modifications. ProtectRNA™ RNase inhibitor (1× final concentration, catalog number R7397, Sigma-Aldrich) was added to each solution, except xylene. Slides were transferred on dry ice from the -80°C freezer to the laboratory bench and immediately placed in 75% ethanol. Incubation in 100% ethanol was extended to five minutes. Following incubation in xylene for five minutes, slides were dried for 60 seconds under vacuum in a dessicator. To analyze RNA integrity in stained tissue sections, RNA was prepared by pipetting 100 μL of extraction buffer directly onto the tissue section on the glass slide and using the pipet tip to gently scrape the tissue into the buffer, which was then transferred into an RNase-free microcentrifuge tube. RNA was extracted and purified using the PicoPure™ RNA Isolation Kit (Arcturus) according to the manufacturer's protocol, including on-column DNase treatment (Qiagen, Valencia, CA). Immediately after staining a tissue section, LCM was performed by a pathologist using a PixCell® II instrument (Arcturus). Thirty minutes on average (± 15 minutes) were spent collecting cells from a tissue section. RNA was extracted from the captured cells and purified as described above. Extracts from homogeneous populations of cells captured on multiple caps from one to six serial sections of each case were combined onto a single RNA purification column to achieve a sufficient yield and concentration of RNA for linear amplification. RNA quality was assessed using an Agilent 2100 bioanalyzer (Agilent Technologies, Palo Alto, CA) and/or a qPCR assay for 3'/5' PSA or 3'/M β-actin (described below). RNA quantity was assessed using a NanoDrop® ND-1000 spectrophotometer (NanoDrop Technologies, Wilmington, DE) and/or a qPCR assay for the 3' end of the beta-actin transcript (described below). First-strand cDNA synthesis was performed using SuperScript™ II or III (Invitrogen, Carlsbad, CA) and oligo(dT)12–18 (Invitrogen) according to the manufacturer's instructions. One μL of LCM RNA was used per 20 μL cDNA synthesis reaction. Typically, 0.25 μL of the resulting cDNA reaction was used per qPCR reaction, and samples were analyzed in triplicate. Primer sequences are provided [see Additional file 12]. Quantitative PCR was performed using a 7900HT instrument (Applied Biosystems, Foster City, CA) and SYBR® Green PCR master mix (Applied Biosystems). Thermal cycle parameters were as follows: 50°C for 2 minutes, 95°C for 10 minutes, 40 cycles of denaturation at 95°C for 15 seconds and annealing and extension at 64°C for one minute. Dissociation curves were generated by denaturation at 95°C for 15 seconds and annealing at 60°C for 15 seconds followed by a gradual increase in temperature (2% ramp rate) to 95°C. Standard curves were generated for each primer pair with serial dilutions of cDNA prepared using a mixture of total RNA isolated from benign and malignant prostate tissues. The results from the tested samples were compared to the corresponding standard curves generated in the same experiment to determine the sample RNA yield. Melting curve analysis was used to assess PCR specificity. Target amplification and labeling were performed according to the Affymetrix protocol , with the following modifications. Since the starting amount of total RNA was only two ng, the poly-A RNA control stock was diluted five-fold more than recommended for a starting amount of 10 ng of total RNA. The T7-oligo(dT) primer/poly-A controls mix was prepared two-fold more concentrated than recommended to allow one μL to be combined with four μL of total RNA sample for first cycle, first-strand cDNA synthesis. The total RNA sample/T7-oligo(dT) primer/poly-A controls mix was incubated at 65°C for three minutes. SuperScript™ III (Invitrogen) was used to synthesize cDNA for one hour at 50°C. In the second cycle, purified cRNA was incubated with random primers for five minutes at 65°C. SuperScript™ III (Invitrogen) was used to synthesize first-strand cDNA for one hour at 50°C. First-strand cDNA was incubated with T7-oligo(dT) primer for three minutes at 65°C in preparation for second-strand cDNA synthesis. After cleanup of double-stranded cDNA, 0.5 μL was saved for qPCR analysis, and the remaining cDNA was used to synthesize biotin-labeled cRNA. Labeling of cRNA transcripts with biotin was performed using the GeneChip® IVT Labeling Kit (IVT kit; Affymetrix, Santa Clara, CA) or the Enzo BioArray™ HighYield™ RNA Transcript Labeling Kit (Enzo kit; Enzo Life Sciences, Farmingdale, NY). Labeling reactions were incubated for 16 hours. Yield of biotinylated cRNA was measured using a NanoDrop® ND-1000 spectrophotometer (NanoDrop Technologies). Unfragmented and fragmented cRNA samples were analyzed on an Agilent 2100 bioanalyzer (Agilent Technologies). Fifteen μg of fragmented cRNA were hybridized to U133 Plus 2.0 arrays (Affymetrix), washed, stained, and scanned according to the Affymetrix protocol . To generate signal correlation scatter plots for replicate samples prepared with the IVT kit or the Enzo kit, un-normalized expression data from GCOS 1.1 were plotted for all genes except the Affymetrix control genes. Unsupervised clustering was performed using dChip version 1.3 software. All 26 arrays were first normalized to the array with median intensity (1041-GP3). The PM-only or PM/MM model was used with expression values that were or were not log2 transformed. 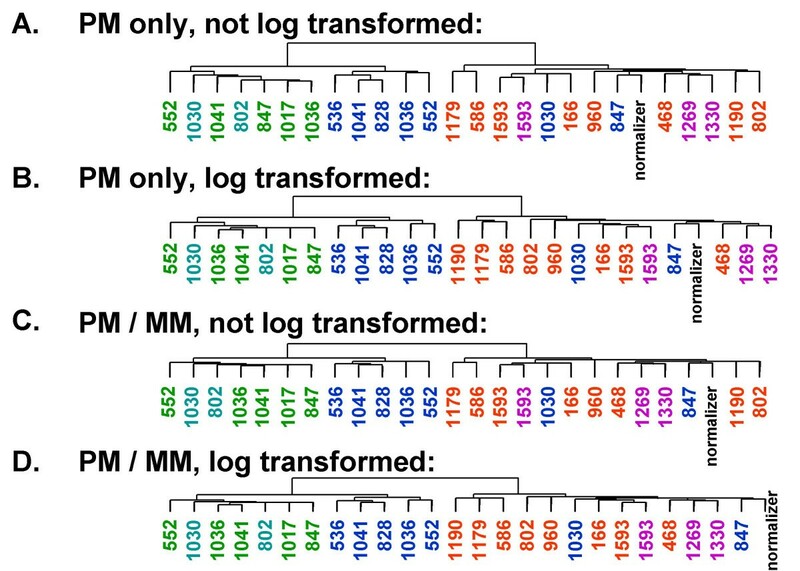 Approximately 1500–2000 genes with the highest standard deviation/mean (not log2 transformed) or the highest standard deviation (log2 transformed) were used to perform unsupervised hierarchical clustering. Funding for this publication was provided by the Minnesota Department of Employment and Economic Development from the State's legislative appropriation for the Minnesota Partnership for Biotechnology and Medical Genomics. The investigators in this project were: George G. Klee, K V Ballman, Erik J. Bergstralh, Michael L. Blute, John C. Cheville, Robert B. Jenkins, Eric W. Klee, Dagmar Marie Kube, Wilma L. Lingle, Ricardo V. Lloyd, Sreekumar Raghavakaimal, Donald J. Tindall, George Vasmatzis, and Charles F. Young from Mayo Clinic; Donald P. Connelly, Lynda Ellis, Suzanne Grindle, Yiannis Kaznesis, and Anne-Francoise Lamblin from the University of Minnesota; and Khalil Ahmed, Akhouri Sinha, and Michael Wilson from the Veterans Affairs Medical Center, Minneapolis, MN. Further funding for this project is from Mayo's NCI Prostate SPORE Grant (NIH/NCI SPORE and Prostate Cancer P50CA91956-5) and a generous gift from The Richard M. Schulze Family Foundation. We thank the Tissue and Cell Molecular Analysis and Microarray shared resources of the Mayo Clinic for their contributions to tissue and microarray processing and analysis of RNA using the Agilent bioanalyzer. We thank the SPORE in Prostate Cancer grant from the National Cancer Institutes (P50CA91956-5), U.S. National Institutes of Health for the specimens. DMK was involved in designing, coordinating, and carrying out the experiments described in this report, and she wrote the manuscript. CDS-H was involved in designing and performing the Laser Capture Microdissection. A-FL was involved in the review of data and editing of manuscript. GV supervised the design and implementation of the overall process. FK was involved in QC data analysis, producing the data in response to the review, and editing of the manuscript. JCC supervised all issues related to pathology and design of the experiments. DPC was involved in overall design of the study and review of the data. GGK was involved in the overall design of study, review of data, and editing of manuscript. All authors read and approved the final manuscript.